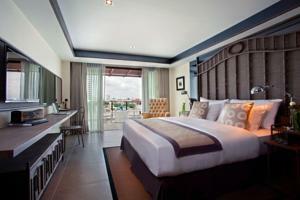 On the charming Phra Arthit Road, Riva Surya Bangkok offers stylish air-conditioned rooms with free Wi-Fi. The hotel has a fitness center and 2 swimming pools for adults and kids. The property is a 5 minute walk from Khao San Road and a 10 minute walk from The Bangkok National Museum. Suvarnabhumi Airport is a one hour drive away. Tastefully furnished with contemporary decor, rooms at Riva Surya feature a flat-screen TV, an iPod docking station and a safe. A minibar and an electric kettle are provided. Free toiletries and a bathrobe are included in a private bathroom. Some rooms have a private balcony. The staff at the 24-hour front desk can assist guests with laundry, safe and shuttle services. Other conveniences include an on-site tour desk and free private parking. Babble and Rum serves an excellent selection of international dishes. Room service is available upon request. Free! One child under 12 years stays free of charge when using existing beds. Free! One child under 2 years stays free of charge in a baby beds. One older child or adult is charged THB 1177 per person per night in an extra bed. The maximum number of extra beds/baby beds in a room is 1. Any type of extra bed or crib is upon request and needs to be confirmed by management. Additional fees are not calculated automatically in the total cost and will have to be paid for separately during your stay.